Less time making, more time doing. JIRA Template Injector is your JIRA creating assistant. It auto-populates each description field with the most effective wording, so you and your team know exactly what needs to be done. Each time you create a new JIRA, the description field is auto-populated with a template relevant to the issue type that you select. Select the template you need, and simply select text between <T1> and <T2> tags for quick template completion. Stop wasting time typing out JIRAs, editing them, and explaining what needs to be done. Limit interface options to keep templates simple, and consistent across all contributors. Easily update and customize each one as needed to ensure each task is communicated clearly, and effectively, based on your team’s needs. Customize pre-populated templates to suit your team’s needs. 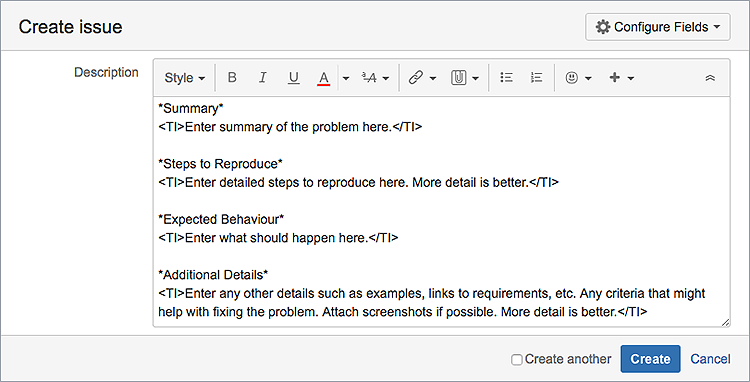 Update wordings, and tags to make creating every JIRA faster, and more efficient. 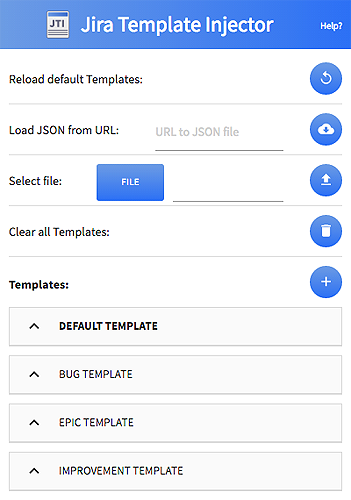 You can add templates individually, or in bulk through a JSON file. Add, remove or edit templates at any time. Templates automatically sync across all Chrome devices that support extensions. Easily access what you need, and get work done, from anywhere. Add the JIRA template injector to you Chrome browser, and spend more time doing.